Lameness is a common problem plaguing our equine athletes. Whether from an injury or just seen as a decrease in performance, early examination can be vital to prevent further injuries. We use a complete history along with a thorough exam of your horse to best assess the next steps taken. Your horse will be palpated then seen in motion, with flexion tests performed. If necessary, nerve blocks can be utilized to isolate the area of interest. 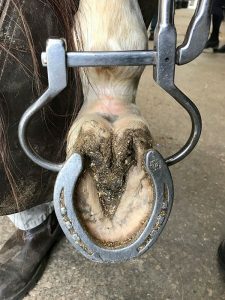 We have advanced imaging techniques, such as digital radiography and ultrasound, to gather images and information about the structures that are suspected to be causing the lameness. After diagnostics are performed, we will come up with a treatment plan that will work best for you and your horse. 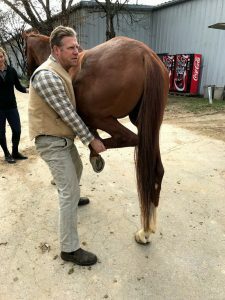 We will often use a combination of treatments to get your horse back to peak performance. Our therapies may include anti-inflammatory drugs, PRP, laser, IRAP II, shockwave, joint injections, acupuncture, chiropractic, and rest. Our team will work closely with you throughout the diagnosis process, to returning to performance, so we can make adjustments in our treatment plan as necessary.